What happened? First, the audience draw was a hit in Australia. It seems viewers who either watched and did not watch spiked an interest on the upset. In Ronda’s fights, her toughest one before Holm was Miesha Tate II. Miesha is very tough, and also deserves all the credit. Miesha is not as refined in striking as Holly, and Holly is tall, lanky, good footwork, and can shut down takedowns. I told one of my black belts about two weeks before the Rousey-Holm fight that I felt the UFC expected Ronda to beat Holly on the ground, but stated to him that I thought Holly was going to frustrate Ronda, outbox her, and if Ronda couldnt get her down it would be over in Round 2. The reason for second round was Ronda’s fight with Miesha II. In that fight, both were exhausted after Round I, and Ronda is a finisher who gives it her all. Donald Trump tweeted: “Ronda Rousey is most definitely a loser. Glad to see that Ronda Rousey lost her championship fight last night,” Lady Gaga added her two cents with, “That’s what you get for not touching gloves!”. I don’t think Dana thought Ronda was going to lose. I think Ronda has been so dominant with her particular style of Judo and boxing that she never expected to get beat at both. But this happened before, in the men’s division. Judoka Karapet “Karo” Parisyan did well in his early UFC’s with his Judo, and had a general rounded game. Parisyan lost via TKO to Thiago Alves at UFC Fight Night 13 in the second round. Ronda’s opponents have not been of the caliber as Holly. In all fairness, Ronda did not quit, or give up, she kept her game plan. But her plan has been the same for al her fights. She strikes enough to get close in, gets a Judo throw, then either submission or strikes. Ronda did not have Holly’s striking skills, and it seems Holly has done good job grappling as well. Remember Ronda tried a throw and was sort of suplexed on her back. I think Holly did not do a Buster Douglas miracle KO against Mike Tyson type victory. That was the best Buster Douglas ever fought and lost to Evander Holyfield after. Although this was Holly’s greatest performance and challenge, she did what is her normal game. And she may be with the exception of Cris Cyborg, the best striker in female MMA. It wasn’t a lucky day, it was her game, and her training. Although Correa posted online an apology, that cruel disrespect for a family death with Ronda has no place in sports or in general. Ronda stopped her in Round 1. Cat Zingano was a potentially good fight with Ronda. However, Cat felt she needed to change her game an overstepped a knee, and fell to a position where she was armlocked. Alexis Davis seemed to be totally out of her element against Ronda. Both of these fighters have more potential than they showed, but at times a fighter can take another out of their fight. I though Cat was going to use her striking skills against Ronda, which would have been a good strategy. Holly even stated you have to have confidence in your game. Competition can be stressful, and pressure can make athletes say certain things. Ronda has been very controversial, and has said many insulting statements. Is the media and fans going really hard on her? Yes, they very well may be. Was this fueled by Ronda’s personality, and public statements? Absolutely. When Miesha Tate lost, no one bashed her, or felt she was arrogant or deserved any attacks in general. When Gina lost to Cyborg in 2009, she graciously accepted defeat, and people still love Gina, her personality, and popularity. She very well may still be the most popular female in MMA, although Holly is getting right there too. What comments has Ronda said in the past that may have fueled anger to fans? 4. In TUF 18, Ronda lost a rock climbing challenge against Miesha Tate. 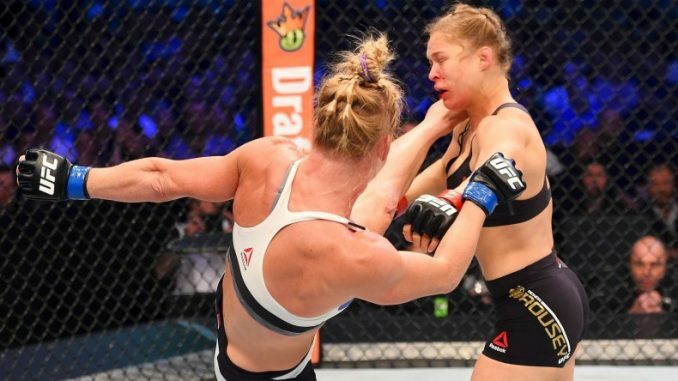 After Tate won, Ronda angrily flipped her off. That’s Marciano’s spirit and class through Holly Holm. Let’s hope Ronda recovers, and is back in the ring. Ronda probably will not change personality, but she may be more reserved in the future. Good luck to her and congratulations to Holly Holm!